Unique solution combining Spirometry and Six Minute Walk test! Spiropalm 6MWT is a new medical device incorporating the latest design for portable spirometry and a unique tool for the standardized Six-Minute Walk Test (6MWT). 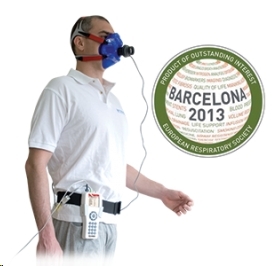 The Spiropalm 6MWT provides the customer with a complete testing package with the ability to measure minute ventilation and breathing pattern during walking together with a fully integrated pulse oximeter to monitor SpO2 and HR during the test.